The globalization of commodity chains is something that students have a general idea about, but I find it challenging to remove the abstract nature of the convoluted path that materials take before they end up in a consumer’s hands. Sure, “everything is made in China” blah blah blah, but the story of the global economy is MUCH more complex and filled with people occupying different social contexts. Planet Money has come to the rescue with an amazing new story tracing every step of something as simple as a t-shirt. 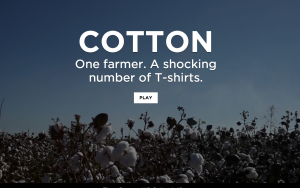 This video, text, and audio tool begins on a cotton farm in Mississippi. Here we see the increasing role of technology even in this very first step. While the invention of the cotton gin certainly contributed to the decline of the amount of labor needed in cotton farming and processing, laptops, GPS-guided tractors and software programs, along with genetically modified seeds now allow just a dozen or so people to produce enough cotton for 9 million t-shirts! So, before we even meet the cotton farmer we need to learn about the laboratory scientists that create the seeds. 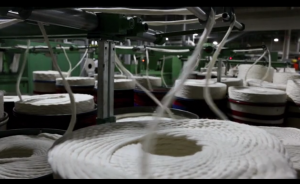 As we see in the next video chapter, the raw cotton is bundled and shipped to Indonesia, Colombia or Bangladesh where it is turned into thread and then fabric – again almost completely by mechanization without human involvement. The video is broken into shorter “chapters” making it a good tool for the classroom. Each chapter break allows for discussion or other augmentations by the instructor. The next segment focuses on labor in Bangladesh and Colombia, allowing for the comparison of different social, cultural, and political contexts. It is the longest of the segments at 6:17. In Bangladesh an estimated 4 million people work in the garment industry. Many of them, young women sent from the more impoverished countryside by their families to the cities to work . Because of the structure of marriage in Bangladesh, young women are seen as an economic burden on their families. Young men expect a dowry when they agree to take a bride; so poor families often end up in debt trying to get their daughters married. 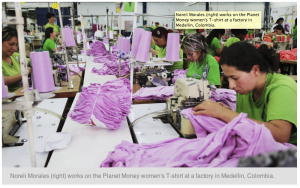 In Colombia, the garment industry is just one of many industries, so wages are higher (four times what they are in Bangladesh) and the employees can realistically imagine the job as a step toward something better. In fact, wages are improving so much in Colombia, that the t-shirt factories are beginning to move out, admittedly looking for more impoverished countries for the lowest wages. The next stage is being boxed up into shipping containers and sent back across the Pacific. 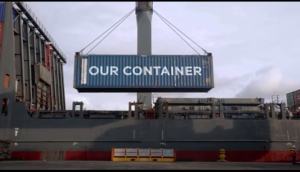 The container ship is certainly a primary, but unsung, element of modern globalization. The relative efficiency of container ships makes shipping one of the lowest cost segments of the total t-shirt. It should be acknowledged that this is reliant on the continued availability of cheap fossil fuel, which many are predicting will not last or cannot be utilized if we are to avoid catastrophic level of climate change. Also, while technology has certainly aided the speed of global trade we should be wary of arguments leaning toward technological determinism. 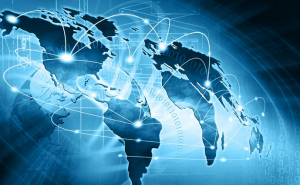 Global trade has been going on for centuries and the increase over the last several decades has been a political and cultural project driven by actors rather than inevitability. A few additional, but important stories that they capture in text and photos instead of video include an additional look at two sisters in rural Bangladesh. The other, that I found very relevant to teaching about the global economy is entitled, “’Our Industry Follows Poverty’: Success Threatens A T-Shirt Business”. It looks at differences in production efficiency and how the growth in Colombia’s economy has led to rising wages and subsequently made it less attractive to companies seeking the lowest wages. 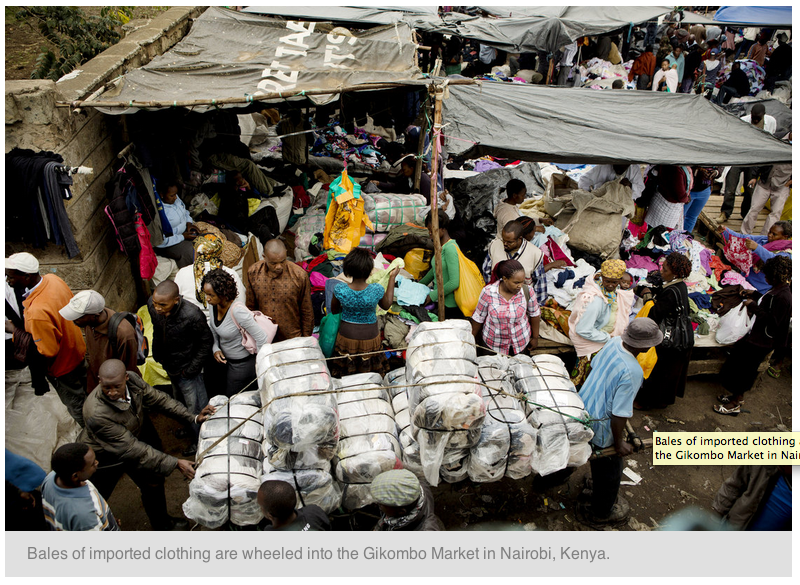 Lastly, there is an accompanying story on how used clothing (including t-shirts) get discarded in the US to organizations like the Goodwill and shipped back to impoverished countries to be resold. This is an excellent, engaging tool to introduce students to the complexity of the global commodity chains, its impacts, and the people involved. Certainly there are elements not covered and details glossed over, but this should peak your students’ sociological imagination and give them some faces to attach to the marco-level studies of economic globalization. The 2008 special issue on commodity chains in the journal, Economy and Society.